Ben Zoma says: Who is wise? He who learns from every person. 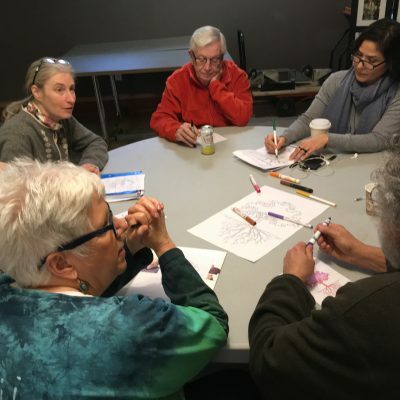 At Congregation Shir Hadash we love to learn: about Jewish texts and traditions; about the world around us; about one another; about ourselves. Reconstructionist Judaism calls us to understand our history and roots in order to create our Jewish future. Many services and events at Shir involve an element of learning through Torah and text study on Shabbat, creative and historical explorations of our holidays, and guest speakers or other modes of learning about current events and important social issues. In addition, our Adult Education Team invites members of our congregation to present topics of interest each month. Topics may or may not have a Jewish or spiritual element. Recent presentations have included: Political Otherness; Freshwater Focus; Jews and Race; and American Jewish Literature: Alive or Dead? The meetings are informal and there is an emphasis on participation.